Vehicle exhaust emissions and excessive smoke from wood heaters contribute to poor air quality in Sydney. Learn how to report and prevent air pollution incidents. During winter, wood and solid fuel heaters can be convenient way to heat your home, however excessive smoke from wood heaters that aren't correctly installed and operated contribute to air pollution and poor air quality in Sydney. These pollutants can cause breathing difficulties, especially for people suffering existing respiratory conditions, such as asthmatics, and for children and frail older people. 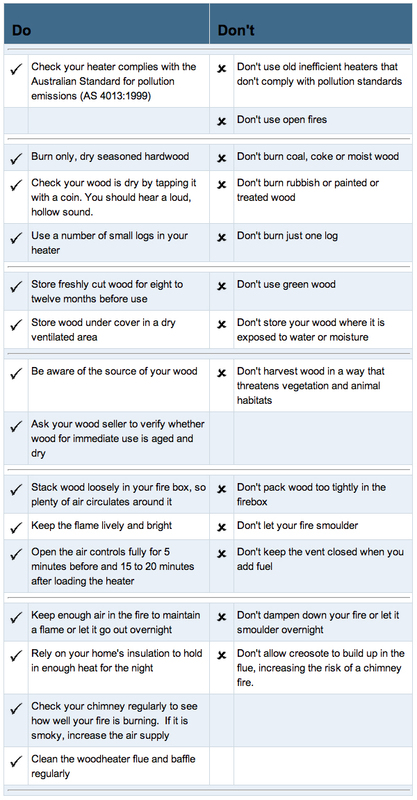 Information on how to select, install and operate your wood or solid fuel heater correctly is available on the NSW Environment Protection Authority (EPA) website. Council officers can investigate concerns about excessive smoke and help to ensure that wood and solid fuel heaters are operating appropriately..
Before installing a new heating system you need to ensure your home retains the heat you put into it. Choosing an appropriate heating system for your home and using it wisely and efficiently. For example a gas fire place, they are less labour-intensive, affordable, more efficient and reduces the impact on the environment and your neighbourhood. Council officers can investigate concerns regarding smoke from wood and solid fuel heaters and if necessary, issue a direction to help ensure that excessive smoke is not emitted from the chimney or flue. The NSW EPA has produced the comprehensive Guidelines on Selecting, Installing and Operating Domestic Solid Fuel Heaters, which is available from EPA Publications. For further information you can contact Randwick City Council on 1300 722 542. Vehicle exhaust emissions are major contributors to photochemical smog and particle pollution in Sydney. When a vehicle is emitting excess levels of smoke, chances are that it is not properly tuned or maintained. Vehicles that emit visible smoke for a continuous period of at least 10 seconds can be reported to the Environment Protection Authority Pollution Phone Line on 131555. Up to 1000 reports are received and acted upon each month. Alternatively, use this EPA website online form Report a Smoky Vehicle. Length of time in seconds that the visible emissions were observed. Colour and darkness, in the opinion of the observer, of the smoke. Location, date and approximate time of day that the observation was made. The green vehicle guide initiative helps consumers choose and compare vehicles based on their greenhouse and air pollution emissions as well as fuel consumption. It includes simple and practical information on how to easily reduce the impact that your vehicle choice and usage will have on the environment.